In this on-demand webcast, Dominic Griffin, Portfolio Manager of the FF American Diversified fund explains his investment philosophy and process, which focuses on quality companies at attractive valuations. Dominic typically invests in businesses that have a strong franchise, a shareholder-oriented management team and an attractive valuation. this webcast Eugene Philalithis, co-manager of the FF Euro Balanced Fund, will give an update on how the balanced multi asset approach has provided strong long term performance over the years through investing in a mix of equities and fixed income. Eugene will outline the fund’s positioning and performance in the context of navigating the recent volatile market conditions and his positive stance in respect of European recovery. So far this year European equity markets have been highly volatile and have experienced significant sector rotations. 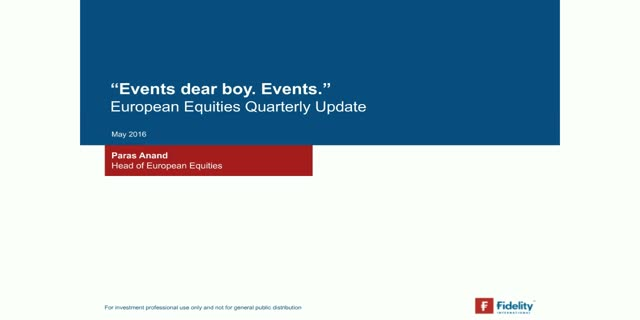 In this live webcast Anas Chakra will give an update on the performance of the fund and outlines his market outlook and how the portfolio is positioned. Fidelity International’s annual Analyst Survey covers all regions and sectors. It aims to identify changes in corporate conditions at an early stage and identify new trends and investment opportunities. The survey is based on Fidelity analysts’ in-depth coverage of their sectors and enriched by insights gained in numerous conversations with decision-makers at companies.